The Roman Catholics, Eastern Orthodox, Lutherans, and various Protestant groups claim to have a common baptism with each other and that they are all part of the same faith, despite other differences. Swiss Catholic and Protestant churches have signed an agreement to recognize each other’s baptisms in part of a growing trend in European and American churches. 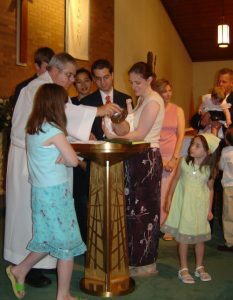 Baptism is the Christian rite of admission that invariably involves the use of water. The day after Easter, a day on which many Christian traditions receive people getting instruction on the rite of baptism, major Swiss churches (Roman Catholic, Reformed, Methodist, Old Catholic, Anglican and Lutheran) signed an agreement on the mutual recognition of baptism. Earlier this year, during the annual Week of Prayer for Christian Unity, several Portuguese churches entered a similar pact. The Anglican Church of Portugal (the Lusitanian Church) hosted the signing, which also included Portuguese church leaders from the Roman Catholic Church, the Orthodox Church of the Ecumenical Patriarchate of Constantinople, and the Methodist and Presbyterian churches. Few people realize how fast the ecumenical movement is moving. That suggests a commonality. That would be consistent with recognizing baptisms of groups that the Church of Rome claims have descended from her. There are many warnings about Roman Catholicism and ecumenism in the Bible. Now, having been to John’s Lateran several times, I can attest to it being within the seven hills of Rome. While Vatican City itself is outside of that ancient boundary, its most ancient basilica in the area is within the seven hills. Interestingly, perhaps it also should be mentioned that Vatican City is believed to have been named after a pagan goddess (Vatika) whose name also was associated with wine. 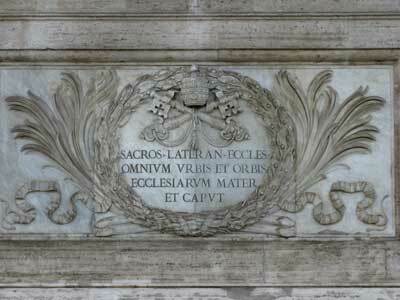 Furthermore, it is actually St. John’s Lateran and NOT St. Peter’s Basilica in Vatican City that the Church of Rome claims to have its ‘cathedra’ (chair of succession). Years ago, when part of LCG, I told the late evangelist Dr. R..C. Meredith that I felt led to tell him that the first seal of Revelation 6 may have been opened around the Feast of Trumpets/Tabernacles in 2009 related to the ride of the ecumenical false rider of the white horse of the Apocalypse. Behind the scenes actions and public reports are consistent with that. But even if that was not the precise time that it occurred, the ecumenical movement is moving quickly. 6 Then he opened his mouth in blasphemy against God, to blaspheme His name, His tabernacle, and those who dwell in heaven. 7 It was granted to him to make war with the saints and to overcome them. And authority was given him over every tribe, tongue, and nation. 8 All who dwell on the earth will worship him, whose names have not been written in the Book of Life of the Lamb slain from the foundation of the world. That is the system that the ecumenical movement is trying to prop up. While there have been many signs and lying wonders throughout history, the time will come when they will become even worse (2 Timothy 3:13; 2 Thessalonians 2:7-12). The world will be deceived (Revelation 12:9, Mark 13:22). The time to stand up for the truth is now and not to wait until the signs and lying wonders appear–they will be very persuasive. Those who wait too late to truly live like a real Christian will be deceived by what is going to come (Matthew 24:24). Furthermore, let me add that infant baptism (which is practiced by the Roman Catholics, Eastern Orthodox, Lutherans, and some others) was NOT a practice of the original Christians. Nor is how many churches perform baptisms consistent with the practices of the original apostles and the other faithful followers of Jesus. Let me close by pointing out that common Greco-Roman baptismal practices were condemned by the Greco-Roman claimed saint Irenaeus in the second century (see Marcus, the Marcosians, & Mithraism) and that church writers have long seen the connection between them and practices of paganism. For more details, check out the article Baptism, the Early Church, and the Continuing Church. Ecumenism and the ride of the White Horse of the Apocalypse Instead of a celebration of a separation from Rome, many celebrated the 500 anniversary of Martin Luther’s 95 theses as an ecumenical time to come together. Vatican, Eastern Orthodox, and and Protestant leaders made positive comments about the 500th anniversary. When does the Bible teach Christian unity is to come about? Is the ecumenical movement good or, instead consistent with something that Jesus warned about? Are Christians to come out of spiritual Babylon and be separate? Has the first seal of Revelation 6, related to the rider on the white horse of the Apocalypse, begun? Had it began before the 21st century? Are there several events that show that this seal may have been opened in September 2009? Or have we at least seen signs consistent with the ride of the white horse of religious deception and ecumenism since that time? What does the Catechism of the Catholic Church teach about other religions like Islam? What does it teach about the final Antichrist? Is the rider of the white horse either the final Antichrist or doing work consistent with the final Antichrist? This is a video. Marcus, the Marcosians, & Mithraism: Developers of the Eucharist? Marcus was a second century heretic condemned for having a baptismal ceremony similar to one still practiced by many who profess Christ, as well as for promoting the ‘eighth day’ ogdoad. Might he also be in the apostolic succession list of the Orthodox Church of Alexandria? Where did the eucharistic host and IHS come from? Blessing of Children or Infant Baptism? Which does the Bible endorse? A video of related interest is available: The Blessing of Little Children Ceremony. Another view of ‘Satan’s Throne’? Is the Cathedra Petri really Peter’s seat or might it be something else? There is also a YouTube sermon about Vatican City, Peter, and this same throne shot in Rome and Vatican City: The Vatican, Peter, and ‘Satan’s Throne’. This entry was posted on Friday, January 26th, 2018 at 8:00 am	and is filed under Church History, Religious News.